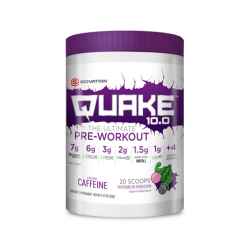 Scivation Quake 10.0 Ultimate Pre-Workout is an earth-shattering pre-workout formula. 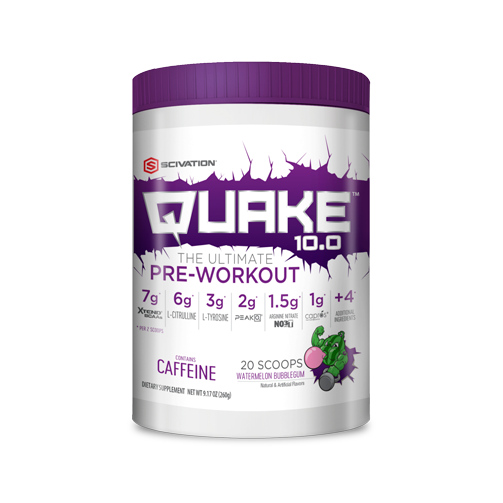 Quake 10.0 is the ultimate pre-workout supplement with 10 power-packed ingredients that will rock your world. Facilitates more oxygen delivery to working muscles - for a ground-rupturing muscle pump throughout your workout - and an efficient delivery of nutrient rich blood to the muscles for greater gains. Capros ensures your muscles can gorge on anabolic nutrients for a devastating performance and mega gains during your workout. Provides steady, sustained increase in blood arginine, which increases recovery time in between sets.v L-Carnitine & L-Tartratev Helps muscles burn fuel efficiently, which reduces fatigue.